Our in-house logistical solutions system monitors all truck movements, allowing for real time accountability and accurate traceability of your product. We design and manufacture vehicles to suit our customers’ logistical solutions. It is part of our commitment to establishing long-term partnerships. Using our established logistics network, we cart approximately two million tonne of product per annum with minimal impact on the environment. We encourage regular performance meetings and reviews to help us improve the quality of service we are delivering. We have implemented the best available, custom-designed technology to optimise our transport operations and provide accurate driver data flow. Family oriented, customer focused, our team of highly experienced transport personnel are contactable 24/7 to receive and dispatch client shipments. 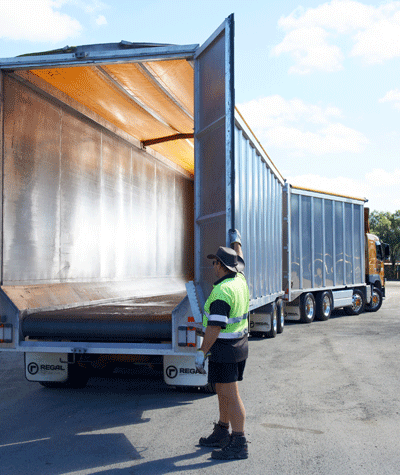 Regal Group is committed to providing an exceptional bulk transport service to clients throughout New Zealand. Our vertically integrated logistical solutions enable us to provide customers with fast, on-time delivery. From export loading to vessel discharge, storage handling and management to tailored engineering solutions, Regal combines experience, excellence and innovation to meet client freight passage demands. Our commitment to innovation enhances our communication and accuracy from the point of pick-up to delivery. Whether your load is 30 tonnes or 30,000 tonnes, we can provide all your bulk cartage requirements.